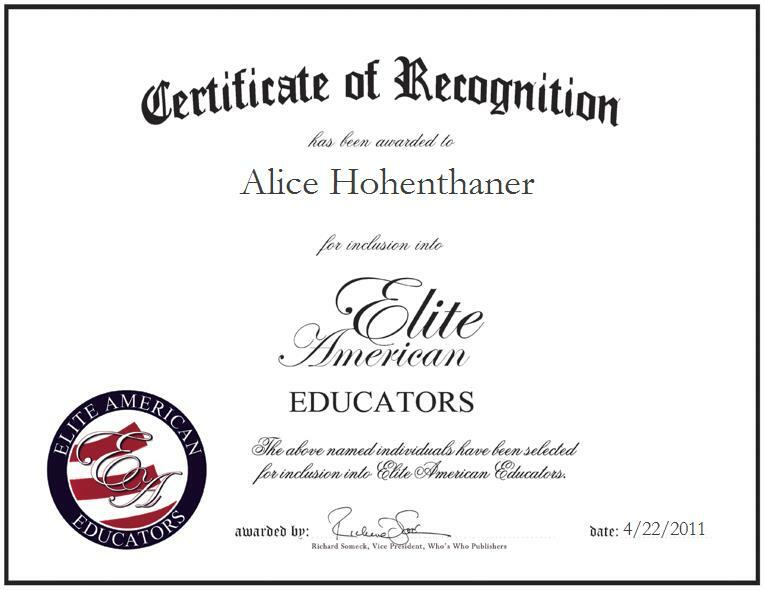 Las Vegas, NV, April 22, 2011, Alice Hohenthaner, Retired High School Music Directer and Associate College Professor, has been recognized by Elite American Educators for dedication, achievements and leadership in music education. With a career spanning nearly seven decades in music education, Ms. Hohenthaner feels it necessary to thank her mother for encouraging her to learn to play the piano at an early age. She was able to develop her virtuosity through hard work, concentration, live performances. In 1964, she completed a Master of Music in piano performance from The University of South Dakota. Following this, she attended the University of Iowa, where she earned a doctoral degree in organ performance. Moving forward, Ms. Hohenthaner plans to continue substitute teaching the organ, and volunteering her time in order to re-establish the importance of music in the lives of young children in the Las Vegas area.